PHP is a scripting language that was designed to create dynamic web pages, and it is known to be as Hypertext Preprocessor. It is mainly a server-side scripting language. Similar to the other scripting languages like Sun Microsystem’s Java Server Pages, Microsoft’s ASP.Net, and Ruby on Rails framework, etc. the PHP script also runs with the help of a parser, along with a web server and a web browser. All these scripting languages provide dynamic content to the client from a web server. Version 5 of PHP scripting language has some improvements on the version 4 of PHP in the areas like Object-Oriented programming, XML, and MySQL. The version 5 PHP provides robust support for Object-Oriented programming, a suite of interoperable XML tools, a completely rewritten extension of MySQL, cleaner error handling with exceptions, and implementation of SOAP web services. With the support of Object-Oriented programming, it offers Constructors, Destructors, Different modes of properties and methods like private, protected, and the public. It also possesses interfaces, abstract classes, class type, static properties and methods, final properties and methods and even a whole suite of magical methods. The objects are assigned and passed by reference and not by value. The MySQL database always pairs with the versions of PHP for the creation of its database. The PHP websites are powered with the MySQL database. The latest versions of MySQL, i.e., 4.1 and 5 have been introduced with some new features that require a few significant changes to the extension. PHP 5 is presented with a completely improved extension of MySQL, i.e., Dubbed MySQL. It comes with Prepared Statements, SSL connections, multi-query functions, and bound input and output parameters. The version of PHP5 comes with the solution of the major problems of PHP4’s XML extension. The XML extensions in PHP 5 are designed to work together as a unified whole. They are standardized on a single XML library: libxml2. It completely complies with W3 specifications. It processes the data efficiently and provides with the right XML tool for the job. The new XML extension makes easy to read and alter the XML documents. PHP 5 offers a new model for error checking which is called as exception handling. It is entirely different from the error checking model in PHP 4. The error handling can be separated as an adjacent block of code from the programming logic. The exceptions are now available for any PHP codes written. Among the available web services, SOAP is a crucial fast-growing component. This extension let the developers implement the SOAP servers in PHP, and it helps the developers in creating SOAP clients with or without a WSDL (Web Services Description Language) file. There is an excellent extension with PHP5 that is written in C language that implements most of SOAP 1.2 version. PHP7 has come up with scalar type hints that are restricted to classes, arrays, and callables. The scalar types include integers, floating point numbers, strings, and Booleans. Along with this feature, PHP7 allows the developer to ensure a better input consistency of the method interface. The anonymous class in PHP7are beneficial for simple one-off objects. With anonymous classes, the developer can define a class and instantiate an object inline like the closure: call () method that is assigned to a variable and declared inline. It can also be used as a callback method. While generator declaration, by using the “yield” keyword, it returns the value that is yielded. It implements an iterator that makes it convenient in using the ‘for’ or ‘while’ loop. The “getReturn” method in PHP7 was added to the generator class to allow the return value in the generators. In PHP7 the null coalesce operator is used for checking the value whether it is set and not null within inline comparisons. The “spaceship operator” in PHP7 is used for comparing values and returns 0, 1 or -1 based on the result of the evaluation. When both the values are equal, it returns 0 when the left value is less than the right value it returns -1, and if the remaining value is higher than the correct value, it returns 1. In PHP7, the errors are raised as exceptions, and they inherit from the Throwable interface. The errors can be caught in try/catch block. Both the error and exceptions can be caught as ‘Throwables’ and can also catch errors as Error objects. The dirname () function is the ideal and significant function in PHP7 to refer to directories relatively. The other features like the integer division function, and “uniform variable syntax.” This syntax was introduced in PHP7 for the indirect way to access array keys, properties and methods. The performance of PHP7 is remarkable faster and impressive than the PHP5 with all the newly introduced embedded functions and methods. The scripting language PHP5 is widely different from PHP7 which is the improved version of PHP5. The first difference lies in the fact that RHP7 is quite faster in performance and execution speed than PHP5. Few such differences would be discussed in this article. As per Zend Technologies, due to the immense upgradation in PHP7, it is often termed as PHPNG (PHP-Next Gen). In PHP7 the developer would be able to declare what type of value would be returned which is not possible in PHP5. The programmers were unable to prevent the unwanted return types in PHP5. The spaceship operator which is introduced in PHP7 for sorting and the combined comparison is not available in PHP5. The significant errors and exceptions can be handled effortlessly in PHP7, but PHP5 cannot handle fatal errors. PHP5 does not support 64-bit integer or large files, but PHP7 promotes 64-bit integer due to which the developers can use native 64-bit integers as well as large files for running applications on 64 bit systems. The Coalesce Operator returns the result of its first operand if it exists or Null if it doesn’t, which was not possible in PHP5. PHP7 has introduced the syntax to escape Unicode codepoint and has deprecated all the MySQL functions, and for that, the developers need to use MySQL which is the upgraded version of MySQL. These are the additional and improved features of PHP7 which are not available in PHP5. The Group Use Declaration is introduced in PHP7, based on which the PHP programmers can include classes from the same namespace that saves a lot of typing time and makes the code look readable. But this facility is not available with PHP5, the previous version of PHP7. Why is PHP7 advantageous than PHP5? 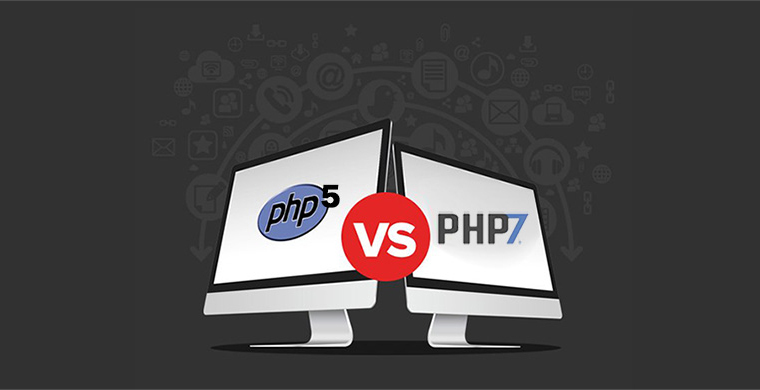 PHP7 is highly advantageous over PHP5 due to the introduction of new features in PHP7 that eases in the coding and development of the websites using PHP7. There is nothing wrong is developing a website using PHP5. It is perfectly fine with all the existing features in PHP5 to smoothly develop a website. But most of the developers prefer PHP7 because of its highly rated performance and fast speed. It is beneficial for the businesses to upgrade their website from PHP5 to PHP7 which would help to grow their business well. The execution speed is very fast in PHP7 that runs the website flawlessly every time it is opened. The PHP7 generally operates on Just In Time (JIT) compiler and compiles code very smoothly. The specification of the type of variable that a scripted function should return makes the developers flexible and convenient in writing codes. All the mentioned bundle of features of PHP7 makes it more advantageous and beneficial for the developers to use while developing a highly functional and featured website. It is more business oriented as PHP7 offers the feature of reduced memory usage native local threat storage and improvements in the execution engine. The websites developed in PHP7 facilitates mobile access. Thus the advantages of PHP7 reaped in this article are factually proved to be beneficial for business purposes that make the execution of the websites faster on a single click. All the mentioned features of PHP7 in this article are upgraded features of PHP, and some are additional features that make PHP7 highly upgraded version than PHP5. The developers need to upgrade their development and coding skills for using the improved and additional features of PHP7 in website development services India. Even the website experiences an extremely new phase with the updated version. Studying the characteristics of the PHP7, it can be concluded that the features that are present in PHP5, have been upgraded in PHP7 along with some additional new features. Thus the competent developers are more comfortable and feel convenient in developing the websites in PHP7.